Administration of Bifidobacteria inhibited IL-17 production by producing IL-10, another cytokine which has a ‘cancelling’ effect on IL-17.Our probiotic formulations do NOT contain dairy, sugar, gluten, soy, corn, casein, yeast, artificial colours, flavours, preservatives, FOS or any Genetically Modified or engineered ingredients. How long will a 50 gram or a 100 gram powder last me? 50 grams is equivalent to 60 adult scoops. Each adult scoop measures 0.8 grams (equivalent to 320 billion cfu’s). If you take one adult scoop a day 50 grams will last 2 months while 100 grams will last 4 months. We also include a child scoop measuring 0.1 gram equivalent to 40 billion cfu’s. 8 baby scoops are equivalent to 1 adult scoop. Our probiotic supplements are temperature stable for 2-3 weeks without refrigeration. 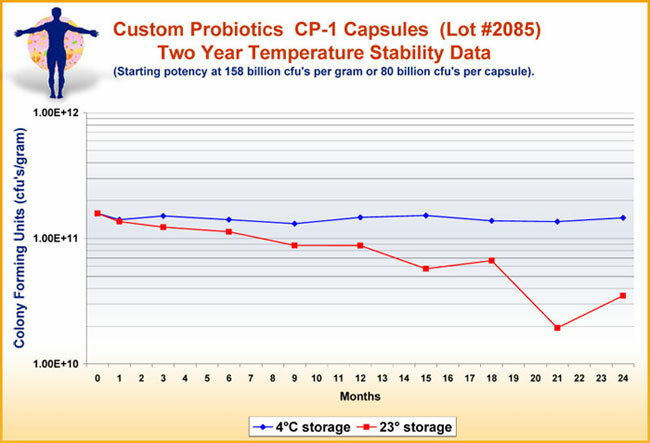 We have done 2 year temperature stability testing on our probiotics . We over design our probiotics so that the loss will not effect the potency indicated on the label. One can travel with our probiotics for 2-3 weeks without refrigeration. It is best however to keep probiotics refrigerated for optimum potency. Powders will benefit from being kept in a freezer. What are Probiotics and how do they work? According to the currently adopted definition by FAO/WHO, probiotics are: “Live microorganisms which when administered in adequate amounts confer a health benefit on the host.” Probiotics are the “good” bacteria that inhabit the digestive system naturally. Antibiotics, infection, bad diet, and stress negatively affect the intestinal microflora. The proper dosage of probiotics will be of great help in normalizing the flora in the digestive system, and hence improve digestive and immune response. Do your products contain any dairy or gluten? All of our products are dairy and casein free, hypoallergenic, and do not contain any artificial colors, flavors, preservatives, sugar, gluten, soy or FOS. They do not utilize milk, milk derivatives, galacto oligosaccharides (GOS) or inulin as added ingredients in the fermentation media. What is the difference between the CP-1 and the 6-Strain powder? CP-1 has 5 strains and is 60 billion cfu’s per capsule at the time of expiration. In addition to the probiotics, it contains microcrystalline cellulose, silcon dioxide and magnesium sterate. The 6-strain powder has an additional strain, L. Salivarius, and is straight culture with nothing else added to it. It is higher in purity and potency with 260 billion cfu’s per gram. In the D-Lactate free formula, what does D-lactate mean and why doesn’t it include the L. Plantarum and the L. Acidophilus strain? D-lactate is a result of fermentation of probiotic bacteria in the digestive system. An excess of D-lactate in our system can produce digestive and neurological problems especially with people with Short Bowel Syndrome and autism. L. Plantarum and L. Acidophilus produce high D-lactate and therefore we do not include them in our D-lactate free formula. Our D-lactate free formula contains L. Salivarius, L. Rhamnosus, B. Bifidum, and B. Infantis, strains that do not produce D-lactate. What is the difference between Yogurt Starter Culture Formula #1 and Formula #2? Although they are very similar in their taste and performance, Yogurt Starter Culture Formula #1 has 3 different strains (L. Bulgaricus, S. Thermophilus and L. Acidophilus) while Formula # 2 contains two additional strains (B. Longum and L. Casei). People on the specific carbohydrate diet use our Formula #1 starter since they do not want to have Bifidobacteria. Should I follow a certain diet while taking probiotics? A lot of our clients have Candida, Autism, food allergies and other digestive issues. Therefore it is best to use a sugar-free and natural food diet with a lot of vegetables, fibers, and some fish and chicken. This is because Candida and bad bacteria grow on sugar. Therefore proper diet and nutrition are very important. Colony Forming Units. It’s the bacterial count of probiotics. How do I know I’m getting the specified amount of cfu’s? We do independent lab testing on our probiotics to verify the bacterial count at the time of sale. Although the count is higher at the time of production, the count on the label is the count at time of expiration, which is one year from the date of manufacture. What is a good dosage? Dosage varies from person to person based on the severity of their situation. These dosages vary from 25 billion cfu’s per day up to 800 billion cfu’s per day. Low dosage probiotics will have limited health benefits. You will need a higher potency in order to achieve the desired results. 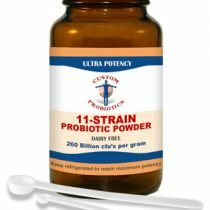 Many of our customers have used other probiotic brands with minimal results due to low potency. Click here for more detailed dosage suggestions. How would I know whether to get 50 grams or 100 grams? It depends on how much you need and how quickly you will go through it. 100 grams is more cost effective. 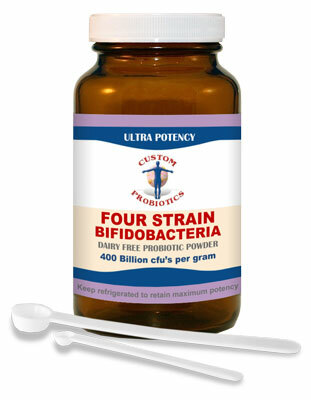 If one uses one adult scoop (200 billion cfu’s) per day of our probiotic powder, 100 grams will last 4 months. What time of day should I take probiotics? And can I take them with other medications, vitamins or antibiotics? 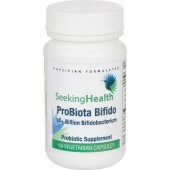 Probiotics are best taken on an empty stomach first thing in the morning and/or at bedtime. A lapse of 30-45 minutes before or after a meal is also recommended. If you are taking antibiotics you should have a 2-hour gap before or after taking the probiotics. What is the maximum amount of capsules or scoops I can take a day? Dosage varies from person to person. Depending on the condition, if you are taking our Adult Formula CP-1, 8 capsules is the maximum amount to take a day (equivalent to 400 billion cfu’s). If you are taking our powders, the maximum amount is 4 adult scoops a day (equivalent to 800 billion cfu’s). 50 grams is equivalent to 60 adult scoops. Each adult scoop measures 0.8 grams (equivalent to 200 billion cfu’s). If you take one adult scoop a day 50 grams will last 2 months while 100 grams will last 4 months. We also include a child scoop measuring 0.1 gram equivalent to 25 billion cfu’s. 8 baby scoops are equivalent to 1 adult scoop. How long will the capsules last? Each capsule will supply 60 billion cfu’s total of five different strains. This potency is guaranteed at the time of expiration which is one year from the date of manufacture. If you take one capsule a day the bottle will last you 3 months. At what age can an infant or child take probiotics? Based on our research the infant dosage of probiotics can be given starting at 6 months up to the age of 3. How much probiotics can an infant take? We supply a baby scoop which is 0.1 gram (the equivalent of 20-25 billion cfu’s). Infants can take from half a baby scoop to 2 baby scoops. Why do some people get a “die-off” reaction? “Die-off” reaction is due to a “war” between the ingested probiotic good bacteria and the bad microorganisms in the digestive system. The more the imbalance of intestinal flora and the higher the dosage of probiotics taken, the higher the “die-off” reaction can be. That is why our dosage protocol is to go up in dosage gradually. What happens if the probiotics stay out of the refrigerator for a few days? The loss is very minimal. We have done 2 year temperature stability testing on it. We overdesign our probiotics so that the loss will not effect the potency indicated on the label. One can travel with our probiotics for 2-3 weeks without refrigeration. It is best however to keep probiotics refrigerated longer term for optimum potency. Why aren’t Custom Probiotics enteric coated? The argument for the need of enteric coating is mainly marketing. It is true that in the laboratory one can demonstrate enhanced survival to acidic conditions when you compare powder vs. enterically coated capsules, however the need for that to achieve efficacy is not demonstrated. Our clinical trials have not been performed with enterically coated capsules, however efficacy is noted. Our strains are also pre-selected for excellent acid/bile tolerance and the capacity to survive intestinal transit. And for the last 11 years we have obtained excellent results from all our clients worldwide.